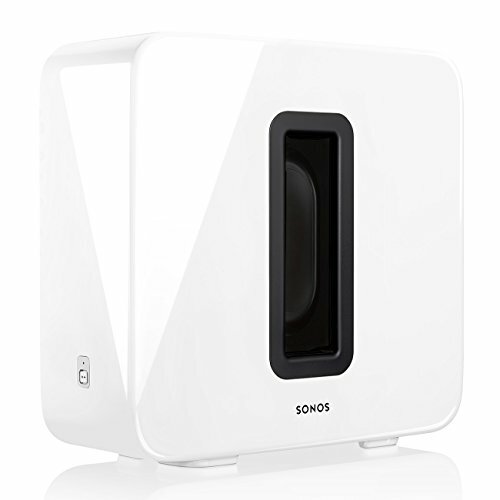 The refreshed SUB Wireless Subwoofer pushes the look of Sonos forward bringing it in line with the PLAY:5. Seamlessly integrates with the Sonos system. No wiring. No programming. Sonos works seamlessly with Amazon Cloud Player AUPEO! Pair SUB with any Sonos speaker and you’ll hear parts of your music that you wouldn’t hear otherwise. That’s because SUB does all the heavy lifting required to deliver the low, low frequencies, leaving the speaker to focus on perfecting the mid and high-range frequencies. It is part of Sonos, the wireless Home Sound System that fills as many rooms as you want with great-sounding tunes. It’s a new, better way to fill each day with the sounds you love. - Display it or hide it. This slim Subwoofer sounds great standing up or on it's side. You can even place it under a couch. Available in black or white.